Buy with confidence knowing every vehicle comes with a CLEAN TITLE, backed by both Carfax and Autocheck. Over 95% of our inventory comes directly off lease from factory finance companies or directly from rental fleets. Every vehicle is pre-sale inspected, serviced and reconditioned to meet the high standards of our customers. Come and see for yourself why hundreds of customers choose Velocity Auto Sales every month to purchase a great pre-owned vehicle. THIS IS INTERNET PRICING ONLY! BRING IN THIS AD. Here at Velocity Auto Sales we work hard to get the car you want at the price you need! Come check out our NO HAGGLE pricing with NO PRESSURE service. Online prices are internet specials only. Bring in this ad to get the best price on your next vehicle. We have financing options available from all of the best banks and credit unions in the state and we buy all trades. Great prices, great rates, and great trade in values, we are UTAHS USED CAR GIANT! Come see us at either of our two locations! Velocity Auto Sales Draper: 620 West 12300 South, Draper, 84020 Phone 801-639-0300 Email Sales@velocitycars.com Velocity Auto Sales American Fork 221 South 500 East, American Fork, 84003 Phone 801-854-5111 Email SalesAF@velocitycars.com Hours of operation are 9AM-9PM Monday - Saturday, closed Sunday. Utah's hottest cars at the prices you need! Visit Velocity Auto Sales American Fork online at velocitycars.com to see more pictures of this vehicle or call us at 801-682-7487 today to schedule your test drive. All advertised prices exclude government fees and taxes, any finance charges, any dealer document preparation charge $399, and any emission testing charge. The price for listed vehicles as equipped does not include charges such as: License, Title, Registration Fees, State or Local Taxes, Dealer Prep, Smog Fees, Credit Investigation, Credit Insurance, Physical Damage, Liability Insurance, anti-theft protection $299 or Delivery Fees. Dealer makes no representations, expressed or implied, to any actual or prospective purchaser or owner of this vehicle as to the existence, ownership, accuracy, description or condition of the listed vehicle's equipment, accessories, price, specials or any warranties. Any and all differences must be addressed prior to the sale of this vehicle. 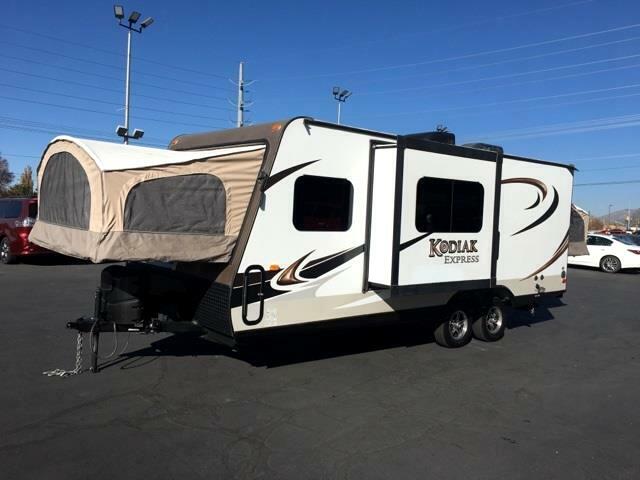 Message: Thought you might be interested in this 2015 Keystone Kodiak.